Posted in Advice from Spiritual Friends, Lama Zopa Rinpoche News. 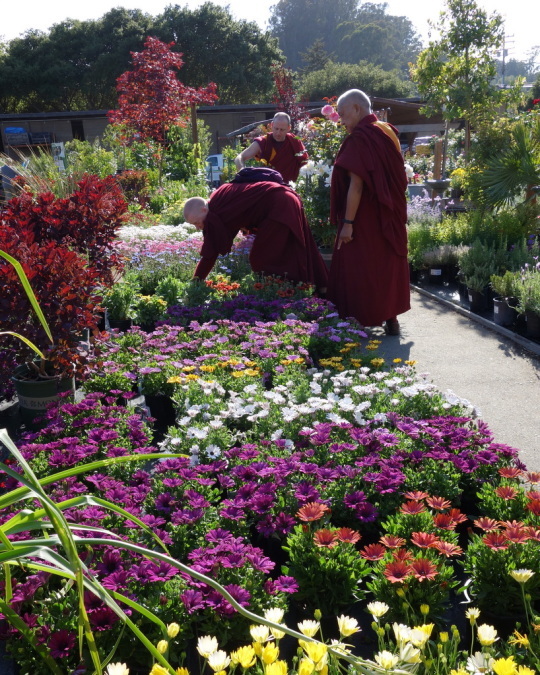 Rinpoche choosing flowers for offerings, Aptos, California, May 2014. Photo by Ven. Roger Kunsang. “The purpose of having this precious human body is not simply to achieve happiness for oneself, but to eliminate the suﬀering of all other beings and to bring them happiness as well,” Lama Zopa Rinpoche instructs in his book Transforming Problems Into Happiness, published by Wisdom Publications. “This is the purpose of each of our lives. This human body is precious because with it you have the capacity and opportunity to pursue spiritual development in order to serve other living beings. “Everyone wants happiness; no one wants suﬀering. The happiness we need is not just ordinary, fleeting happiness; what we really need is ultimate happiness, the unsurpassed, unshakable happiness of enlightenment. When people go shopping, for example, they want the things that are the best, that will last the longest; in the same way, everyone wants the longest-lasting, highest happiness. According to their understanding of what level of happiness is achievable, everyone attempts to obtain whatever is, in their view, the highest happiness. You can read more from this excerpt on Wisdom Publication’s website. More information, photos and updates about FPMT spiritual director Lama Zopa Rinpoche can be found on Rinpoche’s homepage. If you’d like to receive news of Lama Zopa Rinpoche via email, sign up to Lama Zopa Rinpoche News.